Q: How long do our flags last? A: Our most common estimate is 1 year, but many factors play into the life of our flags. If your establishment resides in a more windy part of the country, the life of the flag may be shortened to even 6 months or so. 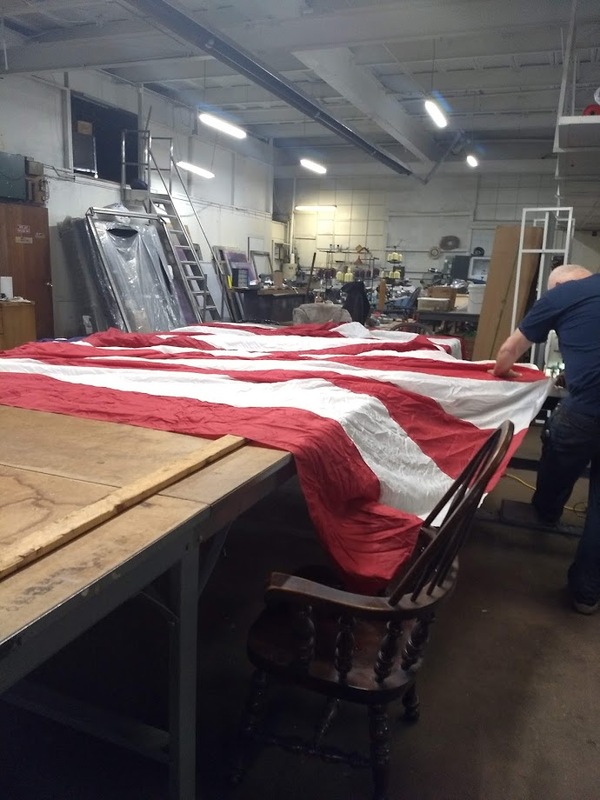 We take steps to ensure that our flags can last as long as possible, including a thick nylon binding, industrial thread, spurred brass grommets and tacked corners and seams. Q: How far will we go to install a job? A: Our owner personally installs jobs in multiple states including Ohio, Pennsylvania, New York, West Virginia, Michigan, and more. Feel free to contact us to find out if your location is included! Q: How long does it take to receive our flags? A: This is dependent on a number of factors. How big is your order, How far away from us you are, and how many orders are we currently working on. It could take as short as a week and as long as a month. Q: What makes our flags any better than any other? A: Our flags are locally produced and we use some of the best materials made for the product! 200 denier nylon, industrial nylon thread, a thick coated nylon binding and spurred brass grommets to ensure a tight grip. We are constantly looking for ways to improve the quality of our flags. Our owner has personally visited many car lots, listened to customers comments, taken notice of how flags wear over time and taken steps to prolong the life of our flags. Q: Will you change light bulbs for me? A: No, we exclusively work with flags and streamers. Changing bulbs introduces a list of additional hazards that we will not take on. A: We also do flag repair! If you have an american flag that is starting to tatter, let us know! We can hem the fly end to cut off separated stripes. It is a cheaper alternative to purchasing a whole new flag. Etiquette dictates that an American flag can be hemmed as long as it retains a rectangle shape.